Sales of Massachusetts single-family homes continued to increase in July, rising almost 27 percent over July 2011, and posting the highest sales volume for the month since 2005, according to the latest report by The Warren Group, publisher of Banker & Tradesman. A total of 4,979 single-family homes statewide sold in July, up from 3,922 during the same month last year. This is the best July for sales volume since 2005, when there were 6,672 sales. 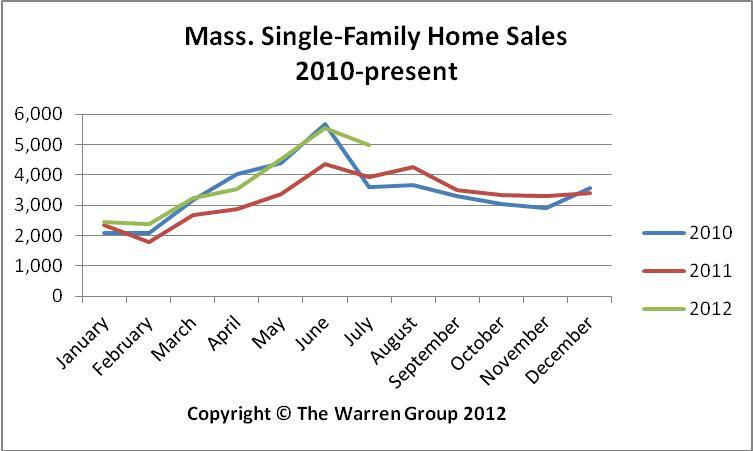 So far this year, 26,596 homes have sold in Massachusetts, up 24.8 percent from 21,319 during the same period in 2011. Condominium sales also increased in July, rising 34 percent from a year earlier. A total of 1,994 condos sold in July, up from 1,487 a year ago. Year-to-date condo sales were also up almost 26 percent, increasing to 10,611 from 8,437 during the same period last year. The median price of single-family homes remained about flat in July, inching up less than 1 percent to $318,000, up from $315,000 a year earlier. This is the second month this year that the median price posted an increase, and the second consecutive month that prices exceeded $300,000. The median price for homes sold January through July was $287,000, down 1.7 percent from $292,000 in the prior year. The median condo price slipped slightly in July. The median selling price was $295,000, down 0.3 percent from $296,000 a year earlier. The year-to-date median price of condos in the Bay State is $280,000, up about 3 percent from $272,000 a year ago.